www.okeechobeejust4bass.com was working for Capt Mike Shellen. 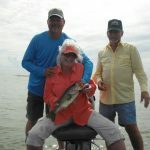 Today I was fishing with Cecil & Cathy Card from Elizabeth, Co and Ed McGuire from Ft Pierce. This was a 4 hour shiner trip and we caught fish up to 4 pounds. Here is a picture of one of them.